If Christopher Walken danced his way through Fatboy Slim's Weapon of Choice video while standing in front of an X-ray machine, it might look something like this screensaver. Skeleton's get their groove on, dancing to eerie Halloween music or to a custom soundtrack created by you. By default, a solitary skeleton dances alone, but the screensaver is easily configured for multiple skeletons in a variety of festive colors. The registered version also entertains with floating ghosts, pumpkins, and other Halloween beasties. With everyone's favorite holiday fright-fest just around the corner, it's time to get the virtual desktop in the party spirit. http://www.jakeludington.com/archives/000399.html If Christopher Walken danced his way through Fatboy Slim's Weapon of Choice video while standing in front of an X-ray machine, it might look something like this screensaver. 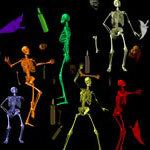 Skeleton's get their groove on, dancing to eerie Halloween music or to a custom soundtrack created by you. By default, a solitary skeleton dances alone, but the screensaver is easily configured for multiple skeletons in a variety of festive colors. The registered version also entertains with floating ghosts, pumpkins, and other Halloween beasties. With everyone's favorite holiday fright-fest just around the corner, it's time to get the virtual desktop in the party spirit.